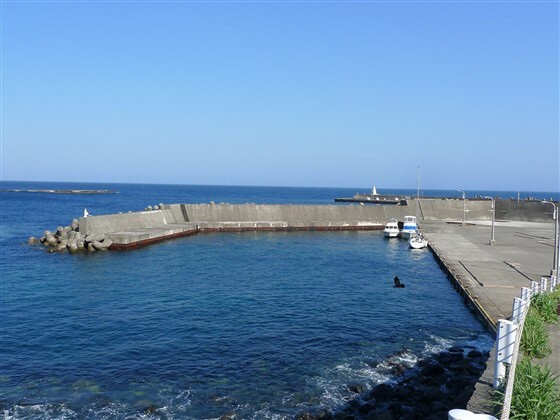 Habu Port is a quiet excellent port which is protected well against winds other than strong southeast wind. But, the entrance area is choppy sometimes as it is narrow. The key to enter is taking 314.1 degree course to align the two guide light poles which stand in the back of the port. Check the two guide poles and their direction on the chart and the port guide. It might be difficult for the first time visitor to identify the two white poles during daytime. Taking the 314.1 course earlier, you can take a whole view of your approaching route earlier. I would suggest you to put your boat first at 34 40.650N 139 27.080E which is about 1 mile to the pole with 314.1 degree. 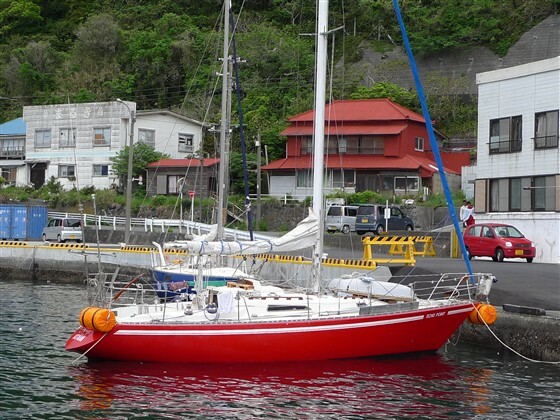 This time, I asked Gyokyo, Fisheries Cooperative Association, which places are good berths for pleasure boats. They generously replied that any open place is OK for berthing other than the just-over-the-water low quay in front of Gyokyo building. I understood that the open places mean the places without buoys. 1) at a black-and-yellow striped quay which is in the left of the low quay in front of Gyokyo. The tiger-striped quay is shown in the left of picture below. 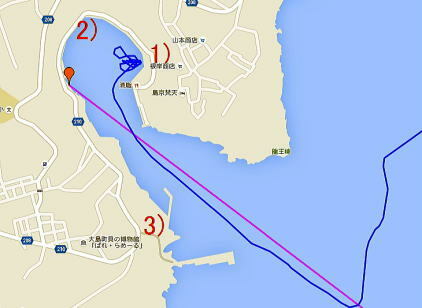 Once you enter the port with 314.1 angle to the guide poles, turn right. Then, on your right, you will see Gyokyo building and an uploading area which quay is very low and close to the sea level. From the end of the low quay, there is the striped higher quay for pleasure boats berthing. But, the area length is just for a couple boats mooring alongside. When I visited there Golden Week holidays in May, that berth place was full. Then, I moored at the low closer-to-Gyokyo quay next to the striped quay though, I didn’t get any complain about it. But, pay attention to the sea level. As the sea level at flood time will be almost same with the quay level, your fenders won’t work, your boat might ride over the quay. 2) at the innermost of the port in the left of the toilet. I used to moor there, which has no buoy. When I visited there this time, there was full of work boats. 3) at a small boat slip between the outmost breakwater lighthouse and the original entrance of the port. It is named Mitsuiso area on the port guidebook. When the original port area is full, it is another good berth. It is also closer to a supermarket at Kudachi area. Water is generously available at Gyokyo. There is another water tap next to the toilet at the innermost of the port. When you need a volume of water for your boat tank for example, use it. But, as Oshima Island’s local water is made by purifying salty water and smells like chlorine, “it is not suggested for drinking” the tourist information center said. Fuel: A big signboard at the innermost of the port says “Misaki-ya shop delivers the fuel”. There is a Sushi restaurant in the back of Gyokyo. Another Sushi and other restaurants are in Kudachi area. There is always-clean Western style toilet is at the innermost of the port. A Japanese style toilet in front of ex Minato-ya Inn is in the back of the bus stop. There are four supermarkets in ten minutes away. At areas of Kudachi, above the shrine, a bus stop at the west side of the port and above the toilet. Buying meat and vegetables, you can live here. A good thing at Habu is that there is an official garbage at the innermost of the port.